Are you a woman who leaks and has strong and sudden urges to go pee? Up at night to pee? Do you urinate frequently? These symptoms and others will be the topic of a discussion scheduled to take place at Shoreline Physical Therapy in East Lyme on Wednesday, December 5th at noon. Dr. Robert M. Spitz will be the featured speaker and we encourage you to join us. 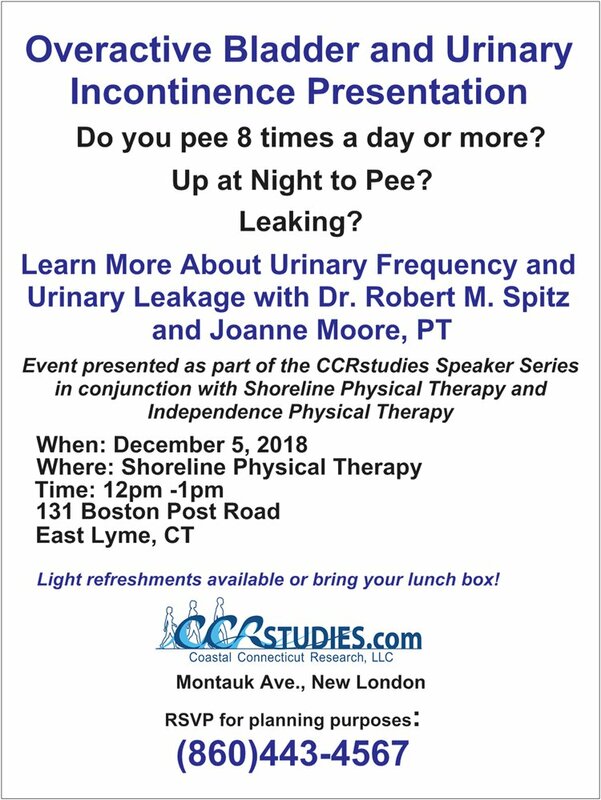 Joanne Moore, Physical Therapist, will also share information on treatment for those living with urinary incontinence. Light refreshments will be served. We hope you can join us at this event. Shoreline Physical Therapy is located at 131 Boston Post Road in East Lyme, just past Flanders Four Corners. See you then! RSVP. (860)443-4567.